In vivo imaging of infection immunology—4I’s! As predicted by the red queen hypothesis, microbial pathogens are probably the major reason for the evolution of the immune system (Paterson et al., Nature 464:275–278, 2010). In general, at the population level, i.e., for most of us, most of the time, the immune response to infection is highly effective. However, there remain significant challenges with particularly intransigent organisms or those that are crossing species barriers. Thus, in some cases, efforts to develop new and effective vaccines and drugs have met with limited success. To paraphrase Rudyard Kipling, “I keep six honest serving men—they taught me all I know; their names are what, and why, and when and how and where and who”. Addressing these key tenets will be key to understanding the interaction between infection and the immune system. This is particularly important, as the early events during induction of an immune response influence the acquisition of effector function and development of memory responses. Our understanding of the interactions of pathogens with the host immune system has largely been derived through in vitro or static in vivo study. This is a significant issue, as the component parts of the immune system do not work in isolation, and their interactions occur in distinct and specialized micro- and macro anatomical locations that can only be assessed in the physiological context, dynamically in vivo. To this end, the increasing availability of genetically manipulable pathogens and high resolution, real-time in vivo imaging over the preceding 5 years has greatly enhanced our ability to understand and evaluate factors involved in host–pathogen interactions in vivo. This article will review the current status of this area, highlight why progress has been faster with some pathogens and tissues (e.g., protozoa and accessible site such as skin), and speculate on what recent developments in biology and imaging will tell us about pathogen-specific immune responses in the future. This will be done by following the chronological development of the infection process from invasion, to recognition, and dissemination. 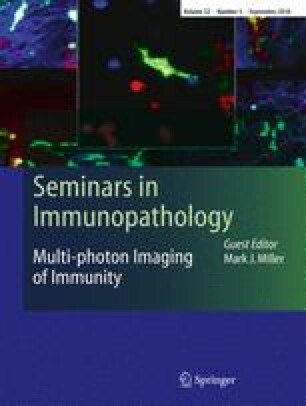 This article is published as part of the special issue on Immunoimaging of Immune System Function.